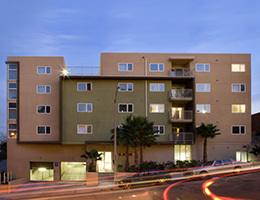 Completed in 2007, Witmer Heights consists of one, two and three bedroom floor plans for large families who desire to live in close proximity to Downtown Los Angeles. 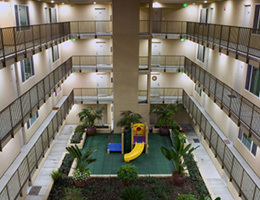 This 4-story contemporary building features a spacious community room with computers and internet service available for tenant use and a total of 7,590 feet of open space, including a center courtyard and two decks providing fantastic views of the Downtown skyline. Located in the rapidly changing Crown Hill Community, Witmer Heights is within walking distance of several new schools and the 10.5 acre Vista Hermosa Park, the largest park to be completed in this area in the last one hundred years. 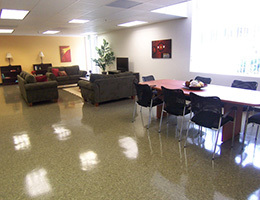 Each of the units is Internet wired and equipped with energy star appliances, formaldehyde free cabinets, spacious bedrooms sizes and a smoke free living environment. The Witmer Heights Apartments are a smoke-free community.